Sereana Kaloucokovale, 14, is a point guard for the Maaqtusiis Thunder, a school in Ahousaht, B.C. Around 5,000 athletes will attend the 2017 North American Indigenous Games in Toronto from July 16 to 23. Their journeys are geographically, financially and sometimes emotionally challenging. And for the teenagers attending the 2017 North American Indigenous Games in Toronto from July 16 to 23, the journeys are all extremely personal. They will arrive by different routes, over thousands of kilometres, with one goal: To be among the 5,000 athletes competing in the largest sporting and cultural gathering of First Nations Peoples on the continent. Among them is golfer Ryan Blair, 13, who's already teed it up at Augusta National, and whose grandmother was taken away as a youth to live in a residential school. There's Warren Collins, 15, who overcame Fetal Alcohol Syndrome to become one of the top 3D Archery competitors in Alberta and who hopes some day to compete for Canada in Olympic archery. There's Tracie Léost, 18, who was so energized by a previous NAIG that the University of Regina student has become a social activist. And a very fleet-of-foot middle-distance runner. And then there are sisters Sereana and Marieta Kaloucokovale, 14, and 16, who spend long hours training but especially travelling, so they can leave their Flores Island home on British Columbia's west coast, a place only accessible by air or water, to play basketball. The NAIG features athletes from all 13 Canadian provinces and territories and 13 regions of the United States, competing in 14 different sports, including baseball, box lacrosse, canoe/kayak, soccer, athletics, and wrestling. The federal and Ontario governments each committed $3.5 million to help fund the 2017 Games, recognizing the event as important to promoting Indigenous sport development in Canada. In Grade 11, Leost, now an 18-year-old distance runner, completed a 115-kilometre solo run over four days to raise awareness about missing and murdered aboriginal women and girls across Canada. Tracie Léost says competing in the 2014 North American Indigenous Games opened her eyes, changed her life, and inspired her to stage a one-girl run along a Manitoba highway to honour Aboriginal women. The Métis runner was 15 when she stood trembling on the start line in Regina. She was nervous to race, but also fiercely emboldened by the opening ceremonies just nights earlier, when she was one of 5,000 Indigenous athletes to parade into Mosaic Stadium wearing team colours. "Being in an atmosphere where Indigenous youth were finally being celebrated was something I had never experienced before," Léost recalled. "Someone speaking that night said 'you're the generation that picks up the broken pieces'. I came home from NAIG super passionate about my people and Indigenous culture." In the athlete's village, she met First Nation kids from all over North America. She had spent time in the Métis communities native to her parents and grandparents and grown up with traditions such as moccasin-making and jig dancing. But she was raised in a middle-class Winnipeg neighbourhood and didn't fully understand the daily struggles of some aboriginal people until NAIG inspired her to learn more. She ran what she calls the three best races of her life, earning bronze medals in the 1,200-metre, and 2,000-metre events as well as the three-kilometre cross-country race, all in the girls' under-16 category. After returning home, Léost enrolled in Grade 11 Indigenous studies. Learning about the epidemic of missing and murdered aboriginal women and girls across Canada prompted her to act. "I started studying it like crazy, doing projects, and I became amazed and furious that in 2015 there was very little conversation about it," Léost said. "I read an article where [former Prime Minister] Stephen Harper said an investigation into this epidemic wasn't a high priority, and the fire that started in me at NAIG started burning inside me like a forest fire." She decided to do a 115-km solo run over four days to raise awareness about the unsettling epidemic. She ran from Oak Point, Man., along Highway 6 to the Forks in Winnipeg, calling it the MMIW Journey of Hope. When her blistered feet got too sore to wear sneakers, she ran in moccasins. Léost raised $6,101 for the Families First Foundation and made national news. Later she was asked to re-enact it in a music video for Run Sister Run, a song by American rocker Cass McCombs. Léost, now 18, is studying social work at The University of Regina. Her passion for social activism and volunteering has intensified, and she fights for Aboriginal women and people with mental illness. It's a big summer for Léost. Not only will she compete in U-19 races at NAIG, but she was also invited to speak before thousands on Parliament Hill on Canada Day in the outdoor WE Day festival. That was staged by the social-activist group WE Charity, founded by Craig and Marc Kielburger to encourage youth to be the change they want to see in the world. "I'm excited to compete, but it's not about the medals for me," said Leost. "I want to meet new people, hear their stories and have an impact on our nation together." WARREN COLLINS, 15, Cochrane, Alta. Warren Collins has dealt with the symptoms of Fetal Alchohol Syndrome (FAS) all of his life, but he refuses to let that derail his dream of some day competing as an Olympic archer. The Nakoda First Nation youngster was adopted by Wayde and Jayena Collins as a 10-day-old baby, already diagnosed with FAS after being exposed to alcohol in the womb. He didn't walk until he was 21/2 years old; he dealt with with learning disabilities in school and struggled to control his temper. When he discovered archery just a few years ago, he found an instant passion for being out in the woods, practising the art of lining up a well-aimed arrow and letting it fly from his bow. It focused his attention like nothing he'd ever experienced. Today a competitive archer, the 15-year-old from Cochrane will compete at NAIG for Team Alberta – part of a journey he hopes some day includes shooting for Team Canada in the Summer Olympics, competing on a professional archery tour and becoming an instructor for youth. The youngest of five kids in his adoptive family, he grew up playing lots of sports from lacrosse to basketball, football and volleyball. But his father, uncle and grandfather were bow hunters, and watching them practise caught his interest. So he started joining them, and on his 12th birthday, his mom took him to pick out his own bow and a 3D deer-shaped target. "I loved it – I'd be out there for hours shooting," Collins said. "There's not much left of that target anymore. It has no legs or antlers left." He taught himself the sport by watching pro archers on YouTube. He used DVDs to help with the mental aspect of training. And, he committed to a physically demanding training schedule that includes hiking and shooting hundreds of arrows each day – pulling back some 45 pounds of weight on every draw. "Once we saw him so passionate about archery and successful with it, we did everything in our power to get him to every competition he wanted to go to," said his mother. "I see incredible growth in him, and he's become very successful. He thrives in the comfort and stability of home, so travelling has really pushed him out of his comfort zone, but he's been competing all over Alberta, and gone to Saskatchewan and Las Vegas. Now he's headed to Toronto." Collins and his parents travel in their motorhome to competitions. In 2016, he won five gold medals in his age group, including at the Alberta Winter Games. He sometimes also registers in adult categories so he can shoot with top competitors, who are often happy to offer him their mentorship. His father – who is Métis – was contacted about having Collins join Team Alberta for NAIG. He'll compete in 3-D Archery in NAIG, which is different from Olympic-style competitions, which use a different style bow and shoot at paper targets. 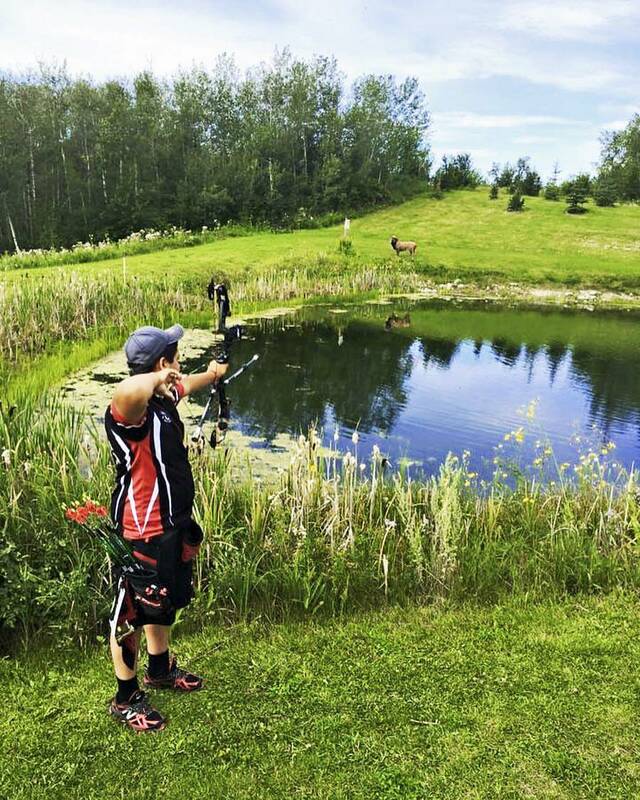 At NAIG, he'll use a compound bow and shoot at lifelike animal-shaped targets in the woods at the Hamilton Angling & Hunting Association. "I'm representing a sport that I love, my province, and I'm very proud to be Indigenous," Collins said. "I'm looking forward to meeting new people and bringing more eyes to archery. It's not a sport that gets a lot of attention in Canada, and I'd like to change that." STUDENTS OF MAAQTUSIIS SECONDARY, Ahousaht, B.C. Samara Swan, 11, runs through the Pacific Ocean to train for track and field on the beach near her home in Ahousaht, on Flores Island in Clayoquot Sound. Maaqtusiis Secondary School is in the First Nation village of Ahousaht, on Flores Island along British Columbia's west coast, a place only accessible by air or water. The students have few sports facilities and programs in the remote ocean-side village, while the long and expensive water taxi ride off the island limits their opportunities to compete with other high schools. Yet eight kids from Ahousaht were able to earn spots on Team BC's Aboriginal squads, and will make the long journey to Toronto for the North American Indigenous Games. Ahousaht is a place with no cellphone service and too few houses for the 900 residents living there among the lush rainforest. Some dwellings have home telephones but most rely on VHF radios to communicate. Its residents must travel some 35 minutes off the island by water taxi year round in order to shop for groceries and supplies. Cedar Wechlin, a teacher from Richmond, B.C., came to work at Maaqtusiis three years ago as athletic director and physical-education teacher. He found a high school that had just been built in 2011 with a mix of modern West Coast architecture and stunning Aboriginal carvings – tradition mixed with a nod to the future. It had a rich history of basketball, but the students rarely went anywhere to play anyone. Otherwise, little else existed there in the way of school sports – something that could help heal a community where isolation had often led to violence, substance abuse and suicides. Wechlin introduced them to more sports, such as volleyball, and added some simple facilities, like a backstop so they could play baseball. He signed the athletes to contracts, insisting they maintain good grades and remain sober, or they couldn't play. They travelled to basketball tournaments at other B.C schools – often eight hours one way. And sometimes they encountered racism when they first arrived. The school has forged countless new relationships with competing schools and hosted opponents for the first time in 20 years, offering their guests a unique cultural experience. Two talented basketball-playing sisters from the school, Marieta and Sereana Kaloucokovale, began travelling off the island for extra training every weekend, all the way to Nanaimo. They went with their mom Marla, who had played basketball in Ahousaht as a girl but rarely got to travel. The sisters tried out for Team BC's NAIG basketball squads, which inspired others from Ahousaht to try to qualify for the Games, too. The Kaloucokovales both earned basketball roster spots, so did other community members, Janessa Swan and Qwammi Robinson. Juniper John Atleo is a rifle-shooter from Ahousaht who asked Team BC how she could try out for the NAIG team from afar. Team BC's coaches mailed her a series of paper targets for her to prove her talent, so she posted them in the woods and did her shooting, well enough to make BC's NAIG rifle team. Wechlin was approved to hold a local track and field tryout and submit his students' results to Team BC. Four of the athletes who attended recorded times fast enough to qualify – Shandon Thomas, Janae Sam, Jaylynn Keitlah and Samara Swan, a determined sixth-grader from the partnering elementary school, whose running times were quick enough for the under-14 girls' track squad. The athletes have been training in Ahousaht's beauty, running on the beaches and trails and strengthening their legs by wading through the chilly, hard-charging waves of the Pacific Ocean as eagles fly overhead. They take their turns in the school gym, which they also share with the community. "Everyone in Ahousaht has tried really hard to help us fundraise and train for NAIG," said 16-year-old Marieta Kaloucokovale, the older of the two sisters. "I want to show them it was worth their time." Among the countless benefits of NAIG, Wechlin hopes it helps to build the athletes' profiles, increases their post-secondary opportunities and encourages other B.C schools to visit them in Ahousaht. "I tell the kids you're putting us on the map," Wechlin said. "Yes, we have a lot of barriers here, but people are starting to notice us. Once they know we're here, and we're competitive and we love to play, they're going to come." RYAN BLAIR, 13, Oak Bank, Man. Ryan Blair is just 13 years old, and the young phenom has already hit golf balls at some of North America's most storied courses, from Pinehurst to Augusta National. Yet the accomplished young golfer often reminds himself that his childhood is remarkably different from that of his grandmother, who was taken from her family as a girl and sent to a residential school in Birtle, Man. When the boy from Oak Bank, Man., tees off at the North American Indigenous Games, he'll be reminded of where he gets his Aboriginal status – from his 80-year-old grandmother, Emily Wooster of the Fish River Cree Nation. He has white skin and lives in an upper-middle-class home, but that hasn't kept him from immersing in his grandmother's story. Blair interviewed her about her residential-school experiences for his social-studies project. "I can't imagine being away from my family for more than a week. Nowadays even when I am away from my family, I can contact them with technology," Blair said. "My grandma couldn't talk to her parents. When she received a letter in Cree, they would take it and crumple it up and wouldn't let her read it. Being away from her family for that long was just wrong." Wooster was on hand for her grandson's biggest golf moment yet. She was in Georgia in 2015 when he was just 11 and the only Canadian competing in the prestigious Drive, Chip and Putt Competition at Augusta National. He aims to play university golf and some day play as a pro. His first challenge, though, is the U-16 field at NAIG. "I've never competed in an all-Indigenous tournament until now and I think I'm going to have a bunch of fun," Blair said. "I'm looking forward to travelling with my team and exploring Toronto and the CN Tower and Hockey Hall of Fame. I'll be staying in the athlete's village and hopefully meeting a lot of cool new people." BRYSON KNOCKWOOD, 19, Indian Brook First Nation, N.S. Knockwood, captain of Nova Scotia’s lacrosse team competing at the North American Indigenous Games, plays for St. FX University during the school year. Bryson Knockwood is coming off a rookie-of-the-year lacrosse season at St. FX University. He was chosen captain of Nova Scotia's team for the North American Indigenous Games and his Facebook and Instagram pages are full of smiling photos with friends, family and teammates. He's the guy everyone goes to for cool haircuts, and the feisty player counted upon for big goals. But for a long while, Knockwood suffered silently with mental illness. Today he's learned to open up. Knockwood grew up in Indian Brook, a Mi'kmaq First Nation community in Hants County, N.S., some 45 kilometres southwest of Truro. The community had its struggles with gambling and substance abuse, and his father Brian worked as an addiction-prevention counsellor there. Lacrosse was something to keep the boy busy and away from all that. Knockwood and other kids there had little money, so they often used whatever they could find to play lacrosse. They fashioned nets from poles or sheds and the goalkeeper used a rake for a goalie stick. His father took him to Halifax in 2007 to watch the world indoor lacrosse championship as Team Canada defeated the Iroquois Nationals in an overtime thriller for the gold medal. The youngster got his hand drum signed by the Iroquois players, and the whole experience stoked his passion for the sport. Knockwood was undersized, but his scoring was undeniable, and it got him noticed. At 12, he first made Nova Scotia's mainstream provincial team for the national championships. He was not used to being a rare Indigenous face on a lacrosse team nor playing a version of the game not intertwined with Native culture. This version felt different to him – more focused on winning and not enough on the art of lacrosse. "It was a culture shock to me because I grew up playing lacrosse rooted in First Nations tradition," Knockwood said. "Team Nova Scotia had been together since they were little kids, so when I joined them, I felt they weren't too comfortable with me, and I didn't feel welcome." Over the years, he grew accustomed to the different styles of play and more comfortable with many people in Nova Scotia's lacrosse circles. He tried to keep his heritage alive, such as smudging his lacrosse stick with sage before games – a tradition his Indigenous teams always did to cleanse away negativity. "They'd be like 'sure man, 'go ahead and do your thing'," Knockwood said. He continued to play across Canada with Team Nova Scotia and was also chosen to its all-Indigenous team to play in his first NAIG in Regina in 2014. He's gone on to play in the East Coast Junior Lacrosse League, a scorer at 5-foot-6, and 180 pounds versus bigger, older players. There, he plays for the Mi'kmaq Warriors, an expansion team with just a handful of wins over the past three seasons, but an organization he treasures. He says the pressures of juggling school, lacrosse and making his home community proud of him often overwhelmed him over the years and he pondered taking his own life. He finally opened up to his father and those close to him in lacrosse, and got help. Knockwood loved his lacrosse experience during his one year at St.FX, and the team felt like family. But the university workload was too much for him. He recently left for Eastern College in Halifax to study barbering, so he can turn his knack for creating distinct men's haircuts into a career. He posts about mental illness on social media, trying to break stigmas and encourage others to talk. He lends his time to coaching a young lacrosse team. "I feel I have my life all planned out now. My biggest issue was I never opened up to anyone about feeling depressed, and now I know that if you open up, it helps a lot," Knockwood said. "I'm taking medication and I feel much better. Lacrosse got me through some dark times and was my escape, and now I'm playing with a clear mind." DAWSON NOOTCHTAI, 17, Atikameksheng Anishnawbek, Ont. Nootchtai won gold in every event he entered at NAIG 2014. He’s back again in 2017 on Ontario’s U-19 team. Dawson Nootchtai had only been kayaking for a few years when he lined up in 2014 to race in his first North American Indigenous Games. The 14-year-old figured he would finish somewhere in the middle of the pack in his events, all for boys' under 16. Instead he earned gold medals in every kayak race he entered – the only three Team Ontario would win in the kayak discipline at those Games. There were only a few entrants in his particular races, but he dominated – winning the 1,000-metre race by 30 seconds and the 3,000 by a gaudy five minutes at the Wascana Racing Canoe Club in Regina on his first day of competition. Without getting too cocky, Nootchtai was able to follow that up by sprinting to victory in a more competitive 200-metre race the next day. "The wins at NAIG gave me a huge confidence boost. I had no idea I'd do so well," Nootchtai said. "Suddenly everyone there knew who I was after winning all those medals." He's about to compete in his second NAIG – this time at Welland International Flatwater Centre, in the under-19 division. "I can't take anyone lightly," Nootchtai said. "It's tough to clear that from my mind that I won by a lot last time. The races could be tougher against faster, older athletes this time." Nootchtai grew up in the Ojibway First Nation community of Atikameksheng Anishnawbek, 20 kilometres southwest of Sudbury, Ont., on the shores of Whitefish Lake. It was a kids' canoe camp that introduced him to the sport. He felt really welcome at the Sudbury Canoe Club and got hooked on paddling. But NAIG was hardly his only athletic success. Since the 2014 Games, he has represented Team Ontario in the National Aboriginal Hockey Championships and earned a silver medal. He's also been a force on the area's high school track scene, winning several Sudbury city titles. Nootchtai still remembers the feeling of sitting among the 5,000 other athletes at the opening ceremonies in Regina, a celebration of Indigenous youth. "You feel like a needle in a haystack amongst all those athletes," Nootchtai said. "But it's one of those great life experiences that you never forget. It makes you feel really honoured to be there competing." The odds have been stacked against young soccer player Leona Berreault for much of her life in a small northern Canadian hamlet. The 16-year-old from Fort Liard, NWT, and her six siblings were mostly raised by grandparents. The town has no outdoor soccer fields, so the majority of her soccer development has taken place inside the school's tiny gym. The kids from remote Fort Liard only find opponents by travelling to far-off tournaments – something they can do just two or three times each year. 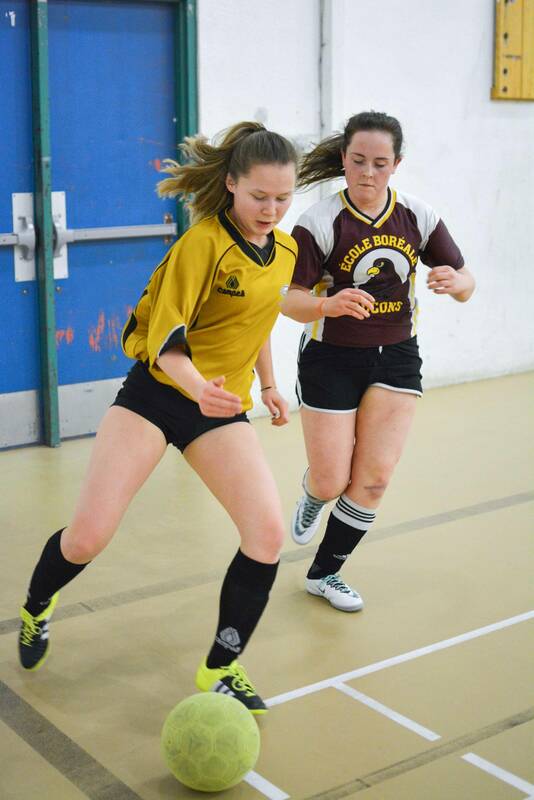 Yet speedy Berreault has still managed to become a talented player and earn a spot on Team NWT's U-16 female roster for this week's North American Indigenous Games. There she will play on the fields of McMaster University – a rare opportunity to compete on a regulation-size outdoor pitch. She says the best outdoor space in Fort Liard to kick around a soccer ball is a dirt patch that doubles as a baseball diamond, and is covered in weeds and whatever the wandering bison leave behind. "I can't wait to see how big the fields are, what I'll run on and how the ball will bounce," Berreault said by phone from Yellowknife, where she was gathered with Team NWT to get a few days of training on grass before flying to Toronto. "I just actually got a new pair of cleats and I'd only worn them once before this week." Berreault only took up soccer a few years ago. The gym at Echo Dene School, the town's lone school for students preschool to Grade 12, was a rare safe indoor space for kids to gather and be active at night, and soccer was among their favourite activities. She stuck to the wall inside the gym at first, terrified by soccer balls whizzing past her and thundering off walls. A mash of kids – big and small, boys and girls – played there nightly. But slowly, she gained confidence. "I was really shy at first, and I didn't do much – it was my first sport," Berreault said. "The guys were bigger and faster than me, but I wanted to be like them and do the cool tricks." She improved steadily and joined in when the kids travelled to compete in tournaments over the following years. A favourite teacher and eventual soccer coach, Sarah Hammond, asked Berreault and other students if they wanted to attempt a long-term fundraising project toward a trip to Spain so they could experience soccer in Madrid. The kids would need to raise over $50,000 for a team and three chaperones to go. "We were like yeah sure, thinking we'll never make it," Berreault said. "But we got really into it, doing loads of bingos and movie nights and other fundraisers and a couple of years later, we had finally made enough money to go." Berreault showed for every fundraiser, often bringing her little siblings along when times were tough at home and the young teen was being relied upon to babysit. For her leadership, the territorial government's Department of Municipal and Community Affairs chose Berreault as NWT's outstanding youth volunteer of the year in 2016. Her passion for soccer blossomed even more. Hammond encouraged the talented player to attend the various tryouts around the Northwest Territories for a spot on the NAIG team. She and classmate Briann Nelson were chosen for the roster, from an initial pool of 100 players. Berreault's younger brother Chase made the boys' soccer team for NAIG, while her older brother Tyrone is going for volleyball. "I'm just trying to be a good female role model for my little sisters Bailey and Destiny," Berreault said. "Bailey is starting school in the fall, and she is already saying 'I'm going to play soccer and be like you'."